CSER are off to Finland! We are very excited to have had two papers accepted for the Koli Calling conference later this year. Koli Calling is one of the highest quality conferences in the area of CS education research, with a strong emphasis on rigorous education research methods. It will be a fantastic opportunity to present our work, and discuss further ideas and projects. 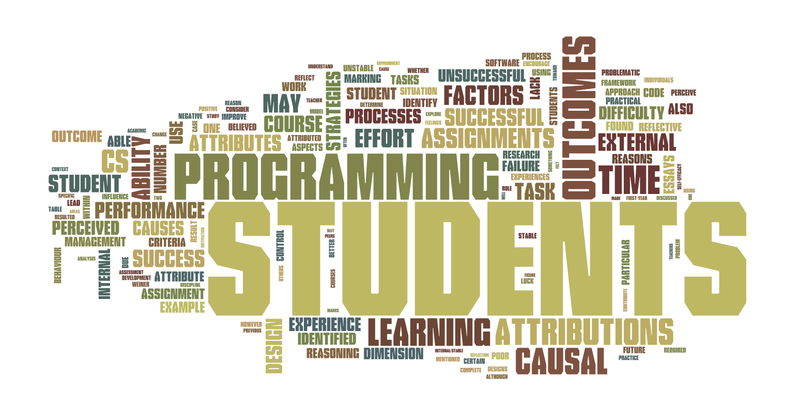 The first paper, Computer science students’ causal attributions for successful and unsuccessful outcomes in programming assignments, which applies attribution theory to help us understand what factors novice programming students identify as leading to successful and unsuccessful learning outcomes. We identified that while many of the factors that students identified were also relevant to other disciplines, commonly the way that students thought about these factors, and articulated them to others, identified CS-specific aspects. This helps us understand how to better communicate with students in explaining better learning behaviours and in guiding them mastery of the software development process. The second paper, Analysing computer science students’ teamwork role adoption in an online self-organised teamwork activity, continues our work in analysing collaborative and student roles in collaborative activities. We analysed a series of online collaborations (with Piazza) according to the different roles that students undertook during the activity, using Dickinson and McIntyre teamwork model as a basis. What we are interested in this work is in identifying methodologies or frameworks that we can use to evaluate the quality of the collaboration within a collaboration activity instead of focussing on the assessment of the outcome alone, which is often where we do focus in our discipline. This paper explores the different kinds of roles that might occur within a collaboration, exploring the specific differences that occur in online collaboration, and specific examples of how this might be interpreted in terms of Computer Science software development methodologies that rely on teamwork. Rebecca Vivian, Katrina Falkner and NIckolas Falkner, Computer science students’ causal attributions for successful and unsuccessful outcomes in programming assignments. Accepted for Koli Calling, 2013. Rebecca Vivian, Katrina Falkner and Nickolas Falkner, Analysing computer science students’ teamwork role adoption in an online self-organised teamwork activity. Accepted for Koli Calling, 2013. This entry was posted in Active Learning, CS Pedagogy, Publications, Research and tagged attribution theory, Collaborative Learning, Education Research, Koli Calling, piazza, teamwork. Bookmark the permalink.